To make the subject and the verb agree in English can seem quite simple. You might think that simply translating from your mother tongue is enough to avoid mistakes. In reality, it is not that easy. Have you ever wondered if it was appropriate to use the plural of a verb for a sentence with several subjects or the singular verb for a collective noun? By agreement, we refer to the set of rules that regulate the relationships between the various parts of speech. In the case of the subject and the verb, in English, the rules may be different from those of your native language. Therefore, it is not a good idea to limit yourself to translation. It is clear that the basic rules set the verb in singular for a singular subject and the verb in plural for a plural subject. Nevertheless, there are many exceptions and special situations. Here are all the rules you must follow to avoid mistakes. What about a sentence in which the subject is a collective noun followed by the preposition “of”? Will the verb be singular or plural? In English, the singular verb is used. Two subjects united by a disjunction require a singular verb. What happens to subjects connected by correlative conjunctions such as “neither … nor …”? In this case, the rule is a little more complex. In English, the verb matches the final subject in the list. For this reason, if one of the subjects is the pronoun “I” then it is better to avoid placing that pronoun at the end. If several subjects are united by a coordinating conjunction, the general rule requires the use of a plural verb. 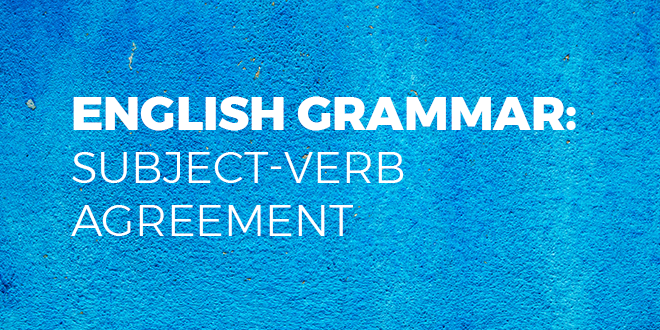 When the subject and the verb are separated by another sentence (called an incidental sentence) or by other expressions, the agreement remains unchanged and follows the general rule. What about units of measurement? Regardless of the sum, the verb must be singular. But, if you are referring to money as an object to be considered individually, then the agreement is then related to the quantity, either in singular or in plural. With expressions that indicate quantities such as “a little,” “a third of,” and “all,” the rule requires that the verb match the word that indicates the object in question. In the case where these expressions introduce collective subjects such as family, group, and panel, the verb can be conjugated in both singular and plural. And the Pink Floyd song? Is it a complete error? Why is the subject in the singular and the verb were instead of was? The reason is this sentence expresses a desire. This is the so-called subjunctive mood which is used to express a wish or an imaginary fact. According to the rule, in this case, the singular subject requires the plural verb. Here we have presented the different cases of subject-verb agreement in English. We hope that we have cleared up your doubts about the subject. Do you want to know more about grammar? Why not you try our online course? ABA English offers 144 free video classes and the same number of short films to help you understand and speak English appropriately in the different contexts of your daily life. You will also have native teachers at your disposal to clear up all of your doubts.